With summer in full swing, it is getting hot and humid here in New Braunfels. Many homes are running their air conditioning units more frequently and for longer periods throughout the day now. With this extra use, many AC units are now experiencing stressors they were not put under during winter and spring. 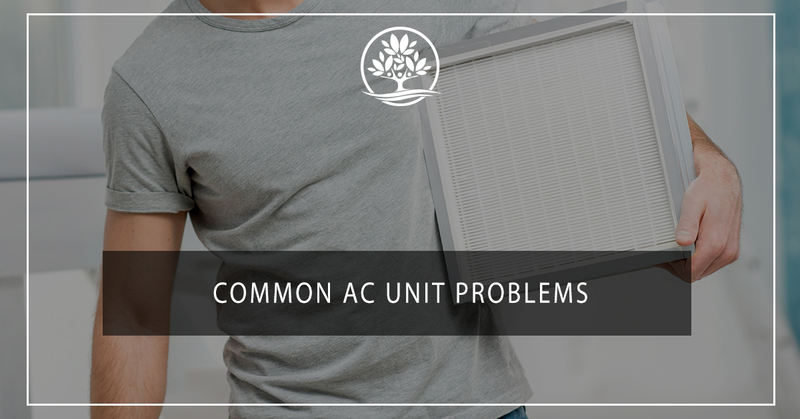 This can lead to a myriad of problems and issues that you’ll need to call an AC and heating repair technician for. Has your AC started making strange noises? Is it not producing cool enough air, or not moving air at all? It’s probably time to call an AC repair technician from Legacy Services. We’ll address your problem, and get it fixed fast. While you’re waiting for one of our speedy specialists, you can brush up on these common air conditioner problems. No matter the appliance, a leak is never a good sign. In the case of your air conditioner, there are a few reasons why it might be leaking. Perhaps the most common cause of leaks is a clogged drain line. The drain line can get clogged with objects like dust, dirt, and molds that are just part of operating outside. In this case, you’ll need an AC and heating repair specialist to remove the clog with a special vacuum. Typically, this fixes most leaky AC units. Over time, as moisture pools on and around various components of your AC, it can cause the formation of patches of rust. This can break apart, and water will drip right through your drain pan. This is most common in older AC units that are 13-to-15 years old. If your air conditioner is installed inside of your home, in the basement perhaps, then you have a specialized part called a condensate pump. This pump moves water that pools up within the AC unit and moves it outside of your home. Should this pump fail or break, water will begin to leak out of your air conditioner and collect within your home. You’ll need to repair or replace your pump immediately to prevent damage to the interior of your home. In most cases, a leaky air conditioner cannot be solved by adding more refrigerant. But in some cases, a leaky AC may be a sign that your unit is low on refrigerant. Low levels of refrigerant lower the pressure in the unit, and that causes the evaporator coils to freeze. When these coils are exposed to the heat from outside, or of the AC unit itself, these coils melt, drip onto the drain pan, and then overflow out of the pan. The obvious signs of low refrigerant are if you hear a hissing or bubbling noise coming from your AC or if the AC isn’t cooling the air as well as it used to. A leaky AC is just one of many problems you might experience this summer. In our next blog, we’ll cover another handful of common problems. When your AC is failing to keep you cool, there’s no need to get hot-headed. Call New Braunfels’ AC and heating repair experts. We’ll send a repair technician to your home right away to repair your air conditioner, no matter the problem. Call now!